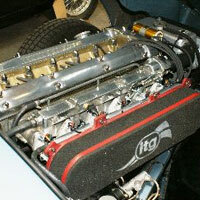 A number of years ago we developed a fuel injection conversion for 12 cylinder Jaguar E Type engines. These conversions have been fitted by ourselves and we have supplied them to others for own fitting. The potential benefits of fuel injection include better throttle response, reduced fuel consumption, increased power and substantially improved torque. 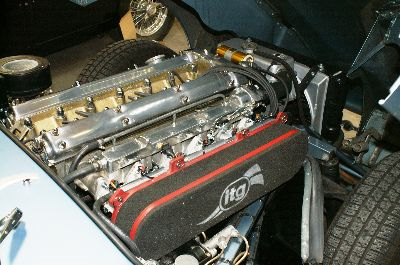 We have now developed a conversion for 6 cylinder E Type engines utilising triple twin-throttle bodies fitted to a standard Weber manifold. A sophisticated, programmable ECU controls fuelling and ignition with multi-site mapping available. Subsequent re-mapping is possible using an RS232 connection to a PC based laptop. Digital or analogue crank pulley sensors are used along with various other sensors as required. One advantage of this system is the ability to store a number of maps, perhaps including one for road use with economy in mind, one for track days where maximum power/torque is wanted, one for low octane fuel etc. This picture shows a system recently fitted to a customers car, previously running triple 48 Weber carburetors. Even before correct set-up on a rolling road, the difference was remarkable, being more responsive and much improved torque. On this car the water radiator cooling fan has been linked to the ECU to allow programming of operation.